Nero is best known for its disc-burning tools, but now that most operating systems offer apps for making your own CDs and DVDs, it's branched out into other areas. With Nero Video Premium HD, the company has set its sights on the home video editor market, with a focus on high-def enthusiasts. While there are several features that put Nero Video Premium HD in a strong position to match its competitors, it's the multicore processor and graphics card optimisation that grab your attention and make a noticeable difference. Editing HD footage is resource intensive, so the support for CUDA and its use of parallel processing is welcome. 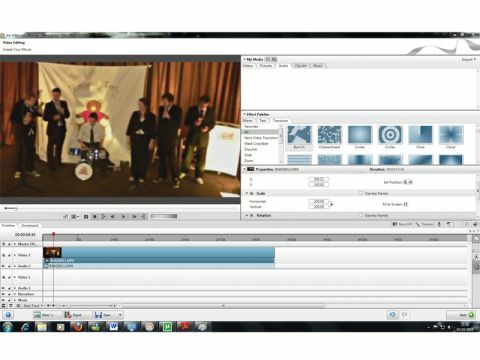 Importing files and adding effects is quick and trouble-free, and the software's interface is superb – you can find the tools you want easily, and view the results in a large preview screen while you edit your movie. There's a wealth of effects to add to your movie, and they're much more impressive than those offered by most editing packages. As you drag and drop them onto your video, they're added to the 'Properties' panel, where you can tweak them on the fly. You can also extract the soundtrack from your footage, which makes fine-tuning the audio a lot easier than normal. A less welcome feature is the Nero Ask toolbar. During the installation process you'll see a prompt suggesting that you install it, but it's a pretty useless addition that hijacks your browser, home page and default search provider. Free programs might get away with trying to install sponsored toolbars, but it leaves a nasty taste in the mouth when products you've paid for attempt the same trick. As you'd expect from a Nero product, there's a wide array of export and disc-burning options, enabling you to display videos on almost any medium, from Blu-ray to YouTube. It might indulge in some less attractive habits, such as trying to install unwanted and unnecessary programs, but Nero Video Premium HD is a decent tool for editing high-def video.